Air conditioning (cooling) is refrigeration applied to keeping the space temperature of a building cool during the hot summer months. The air-conditioning system (refrigeration) removes the heat that leaks into the structure from the outside and deposits it outside the structure where it came from. Heat leaks into a structure by conduction, infiltration, and radiation (the sun’s rays or solar load). The summer solar load on a structure is greater on the east and west sides because the sun shines for longer periods of time on these parts of the structure. Refrigerated air conditioning is similar to commercial refrigeration because the same components are used to cool the air: (1) the evaporator, (2) the compressor, (3) the condenser, and (4) the metering device. These components are assembled in several ways to accomplish the same goal, refrigerated air to cool space. The four components are assembled into two basic types of equipment for air-conditioning purposes: package equipment and split-system equipment. With package equipment all of the components are built into one cabinet. Air is ducted to and from the equipment. Package equipment may be located beside the structure or on top of it. 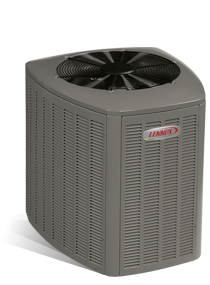 In split-system air conditioning the condenser is located outside, remote from the evaporator, and uses interconnecting refrigerant lines. The evaporator may be located in the attic, a crawl space, or a closet for upflow, downflow, or horizontal applications. The fan to blow the air across the evaporator may be included in the heating equipment, or a separate fan may be used for the air-conditioning system. The evaporator is the component that absorbs heat into the refrigeration system. It is a refrigeration coil made of aluminum or copper with aluminum fins on either type attached to the coil to give it more surface area for better heat exchange. The evaporator coil has several designs for airflow through the coil and draining the condensate water from the coil, depending on the installation. The different designs are known as the A coil, the slant coil, and the H coil. 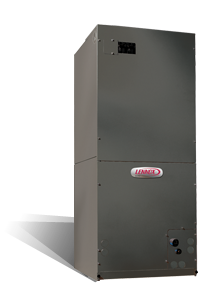 The evaporator is a heat exchanger that takes the heat from the room air and transfers it to the refrigerant. The following types of compressors are used in air-conditioning systems: reciprocating, rotary, scroll, centrifugal, and screw. Compressors are vapor pumps that pump heat-laden refrigerant vapor from the low-pressure side of the system, the evaporator side, to the high-pressure, or condenser, side. To do this they compress the vapor from the low side, increasing the pressure and raising the temperature. The condenser for air-conditioning equipment is the component that rejects the heat from the system. Most equipment is air-cooled and rejects heat to the air. The coils are copper or aluminum, and both types have aluminum fins to add to the heat exchange surface area. Air-cooled condensers all discharge hot air loaded with the heat absorbed from within the structure. Early condensers discharged the air out the side and were called side discharge. The advantage of this equipment is that the fan and motor are under the top panel. 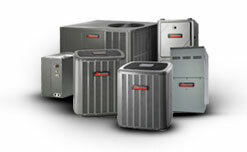 The modern trend in residential equipment is for the condenser to be a top-discharge type. In this type of unit, the hot air and noise are discharged from the top of the unit into the air. This is advantageous as far as air and noise are concerned, but the fan and motor are on top of the equipment, and rain, snow, and leaves can fall directly into the unit, so the fan motor should be protected with a rain shield.